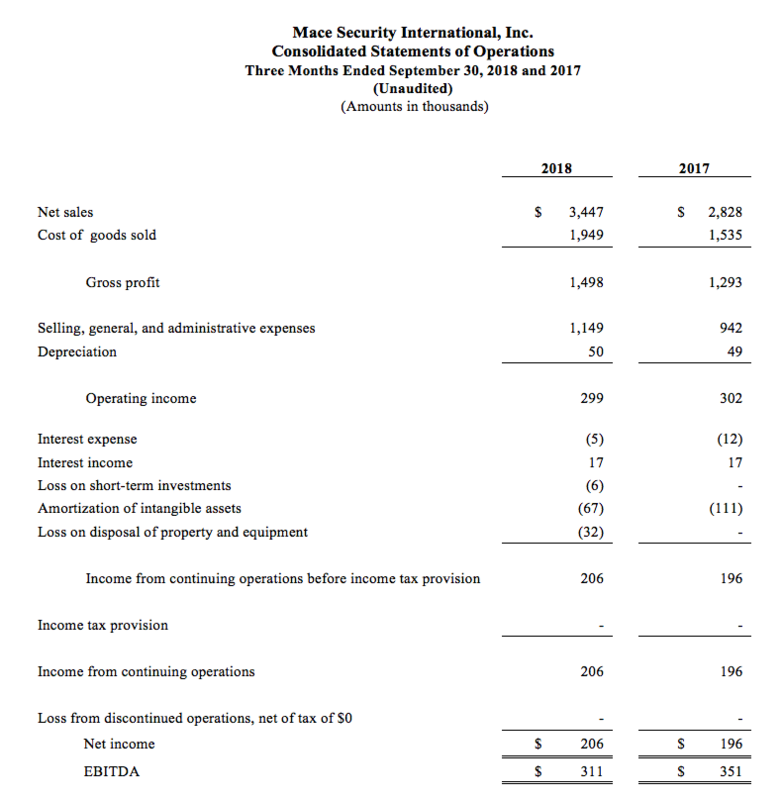 CLEVELAND –November 12, 2018 – Mace Security International, Inc. (OTCQX: MACE) today released unaudited financial results for the quarter ended September 30, 2018. The Company is pleased to announce another quarter of increased revenues with third quarter net sales of $3,447,000, a 21.9% increase over prior year third quarter. The increase was mainly driven by increased sales through our Consumer and International distribution channels. 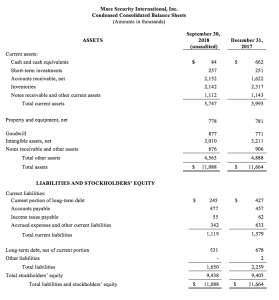 The Company also reported its second consecutive quarter of positive EBITDA of $311,000. 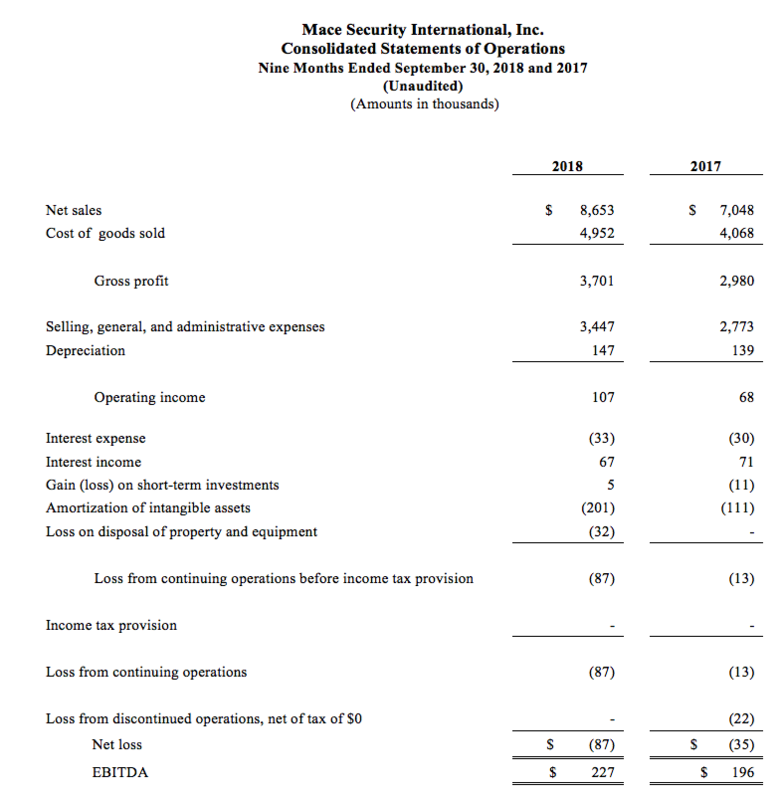 Third quarter net income and EBITDA were lower than prior year due to one-time expenses and increased advertising and selling expenses to drive Ecommerce sales. “We’re very pleased with the sales growth we experienced in the 3rd quarter, as well as another consecutive quarter of positive EBITDA. The Company has reported positive EBITDA in five of the last six quarters. 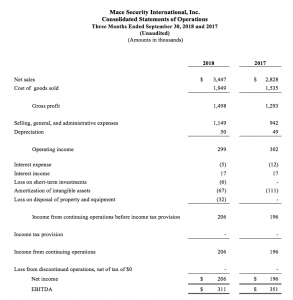 We also anticipate improved profitability moving into the fourth quarter, as selling, general and administrative expenses normalize in relation to revenues,” stated John McCann, President and CEO. “Elevating our Ecommerce platform and enhancing our presence online promises to improve overall sales,” McCann continued. “This will be a key focus leading into 2019 – clarifying our brand and product position in the marketplace, as well as offering best-in-class digital experiences that catalyze online sales. To assist, we have hired a marketing company to focus on building stronger content and messaging to grow the category.” Emphasis on sales growth through Ecommerce extends to the Company’s own website, as well as numerous partners sites and platforms, all of which continue to improve. 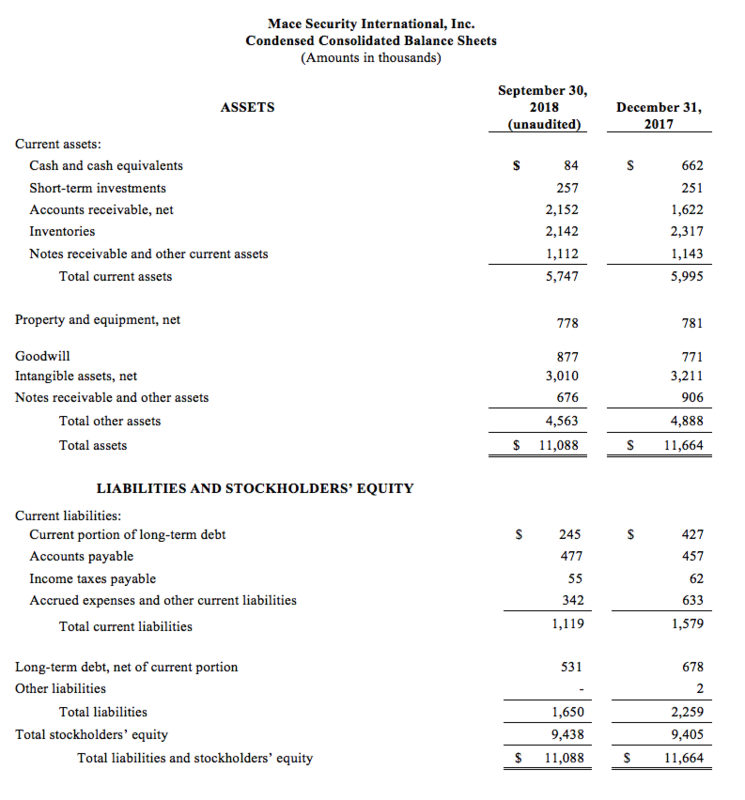 The Company continued to grow revenues and gross profit. 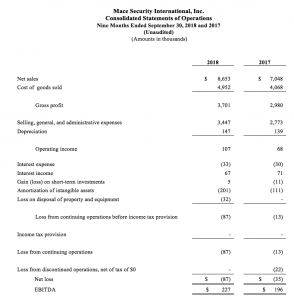 Although the Company is pleased with the improvement, there are a number of initiatives that took place which will help the Company continue these positive trends in revenue and gross profits. These initiatives included the upgrade of its Ecommerce and EDI platforms to support continued sales growth efficiently and cost effectively. In addition, the Company hired Paul Hughes as Executive Vice President. Hughes, whose hire was announced on Nov 8th, has a strong track record of innovative approaches to revenue generation and leveraging emerging technologies to support business growth. He comes to the Company with extensive experience refining Ecommerce and multi-channel sales, including leadership positions at Guardian 8 Holdings and Taser International. His most recent position with the Arizona Commerce Authority helped to quadruple business opportunities in the territory under his management. Mace® will conduct a conference call on Tuesday, November 13, 2018 at 11:00 AM EDT, 8:00 AM PDT to discuss its financial and operational performance for the quarter ended September 30, 2018. The participant conference call number is (877) 719-8065, conference ID: 3772047. A full set of the consolidated financial statements are available on the Mace website. Presentation materials for the conference call will be available Tuesday, November 13, 2018 on Mace’s website under Investor Relations, Shareholder Transcripts & Presentations http://corp.mace.com/investor-relations/shareholder-transcripts-presentations/ A recording of the teleconference will be available on the Mace website within 48 hours of the teleconference. For more information, please visit www.mace.com.